I’ve been making lots of ATCs lately because I’m in a swap where I send my partner 20! WOW, I know! So I’ve been searching through all kinds of images I’ve printed, coloured, stamped whatever, anything that shaves a bit of time off of making them! 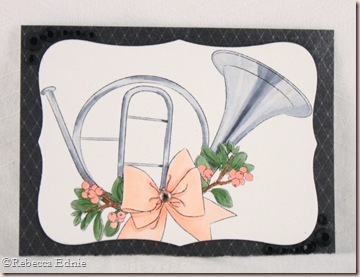 I love this pretty image from Doodle Pantry called French Horn. I’ve been trying to make my Copic colouring more realistic so I heavily relied on Google images of French horns. Most are brass coloured but a few are silver and some are even funky colours! So, in the spirit of realism, I coloured this as though there are lots of reflections on the horn. It looks pretty flat on here but IRL, I coloured it with a clear Spica pen so it looks nice and sparkly! I hope it doesn’t look to weird to those of you who haven’t Googled French Horns lately! I guess I should have printed it a wee bit smaller but when I printed it, I didn’t have an ATC in mind necessarily. I meant to do the ‘Outside the Box’ technique on the bow but would you believe, I forgot? Seriously? In case you don’t know it, it is the technique where you pre-cut areas of the image that stick out beyond the die’s edges and keep them out of the way while die cutting. It is a great look, bummer huh? Gorgeous colouring, wow! 20 ATC's, now that I call a challenge:) Love this ATC, so very, very nice!! WOW, this is fabulous Rebecca!! Your coloring is soo perfect too! =) Very nice! Amazing! Your coloring is breathtaking! Gorgeous, Rebecca! WOW, That's a lot of these cute little cards What fantastic coloring of the horn. Wow, this is beautiful! Yes, this definitely looks realistic, I can see the reflections! 🙂 Twenty ATC's, WOW! ATC's are fun, though. It makes me want to go make one! Thanks for sharing!! TWENTY??? Wowzers, girl! That's a lot of ATC's! Very pretty! 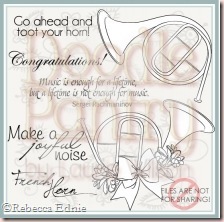 Love your coloring on the french horn – it looks SO realistic! Thanks for sharing!